This is my first useful (I hope) blog post detailing what I’ve been trying to get working for the past week. I wanted to be able to record and graph the light levels out of my window in a similar way to how I do power and temperature with my Currentcost display. I bought a Current cost analogue development board from Ebay and found a bit more about the specification from the Current Cost Technical Blog. It seems that the “4P4C jack” that is referred to in the text of the spec has been replaced by the 3 blue wires. It caused me some confusion working out that it is not necessarily the left most blue wire, as shown in the photo, that is the input. In my case the blob of glue meant the middle wire was the positive input. The Solar cell I hacked out of a garden light. It produces from 0V to 3.2V within the spec of the board which will accept 0-4V. 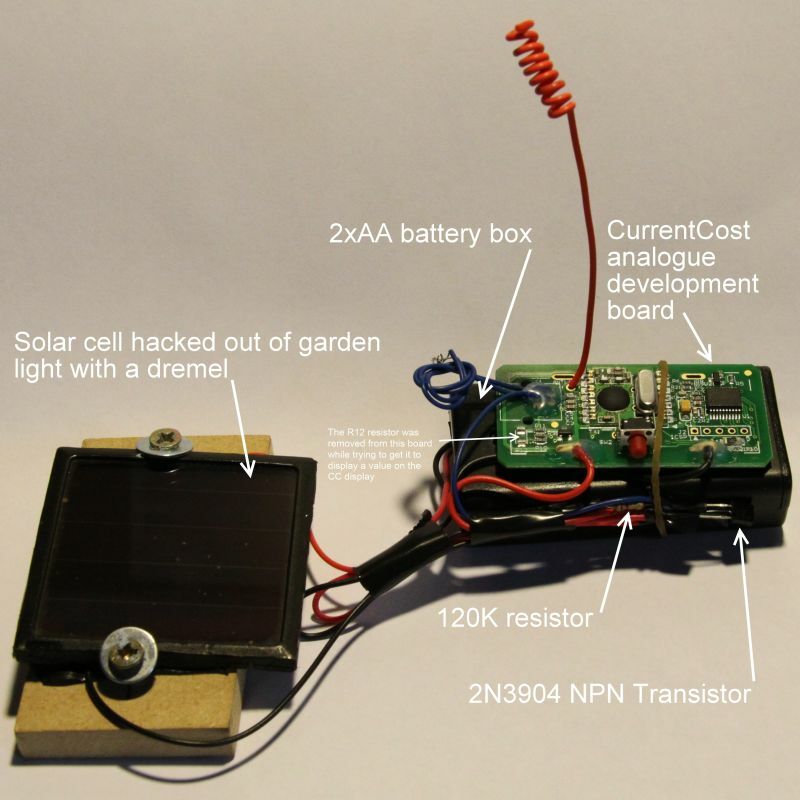 I couldn’t get the board to transmit a value using just the solar cell, although 1 or 2 AA batteries across the input would display a number of watts. So I tried a little transistor circuit shown below. The CC display shows anywhere from low 10s of watts when the solar panel is covered up to a maximum of 23.1KW when exposed to light. The 23.1KW value is shown for any light level above dull daylight so I may have to give the solar cell some dark glasses or cover bits of it with masking tape to get it to peak for bright sunlight. I hope that is useful to someone. I’ve now got to integrate it into my rrd database and graphing scripts, maybe I’ll post again with some of the output in a few weeks.